The Bloom Intelligence WiFi Marketing Automation and Customer Intelligence Hub is a powerful restaurant marketing platform that restaurants use to grow their business. Bloom provides restaurant marketing professionals with actionable presence analytics and customer profiles to personalize their customers’ experience and optimize restaurant operations. In addition, the marketing hub allows you to automatically send offers, messages, and ratings based upon your customers behavior. Utilizing your guest WiFi access points, Bloom gathers anonymous customer data letting you know about who is visiting your establishment, how often they’re coming back, how long they’re staying, and much more – even if they never log into your WiFi. Bloom Intelligence also features a suite of powerful marketing tools that allow you to create real-time, automated behavior-driven restaurant marketing campaigns that build customer loyalty and maximize your restaurant marketing ROI. In addition, the Bloom platform provides tangible attribution on every campaign you create when remarketing for restaurants. You’ll save money and time as you improve your marketing efforts and results, save on advertising costs, and make better business decisions. Bloom gives you the ability to sort, filter and save your customer profiles into various customer lists. This allows you to begin creating much more effective and profitable offline targeted marketing campaigns. By using restaurant marketing segmentation, you can send different messages to different groups, instead of sending a single mass-message to your entire customer database. It has been proven in many studies that segmented, targeted marketing is much more effective for customer engagement and overall marketing ROI. We allow you to stay ahead of customer sentiment and stay proactive about your reputation by measuring your customer behavior in real time. You can stop poor ratings before they reach popular rating sites. – i.e. TripAdvisor, Google, etc., and encourage good raters to post their experience online. Build a successful customer loyalty program for restaurants or integrate and make your current loyalty program more effective. Bloom tracks every device that enters your restaurant, whether it is logged into your guest WiFi or not. However, when a customer logs into your WiFi, their previous and future visit data is attached to their customer profile. Bloom utilizes advanced algorithm sets that include machine learning and predictive analytics to provide deep customer insight that can be used to create automated marketing campaigns to send messages, offers or surveys based upon your customers’ behavior on- or off-premise. You can track the effectiveness of all campaigns with our advanced attribution models that know when a customer receives a message, returns to your locations, and redeems your offers at your restaurants. Then you can take the guesswork out of restaurant marketing. The restaurant industry is extremely competitive and restaurant marketing continues to be as difficult as ever. However, Bloom Intelligence can give you that necessary competitive edge by engaging your customers on a much more personal level. It’s time to start leveraging your guest WiFi to gain a competitive edge. Then watch your profits grow. 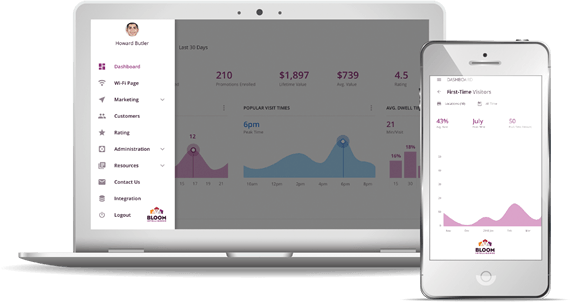 Schedule your free demo today and see how Bloom can help your business grow.